The Metallic Wafer Style Sampling Valve (SD IL 300) and PFA lined Wafer Style Sampling Valve (SD IL 400) are designed to take representative samples from process pipeline. The wafer style design enables simple, yet robust operation. 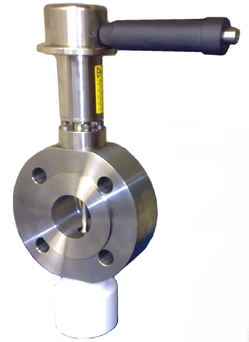 By using PFA for the wetted surfaces the valve is able to be used in very corrosive processes. Inline Samplers are commonly used where chemicals are being introduced into the process or between process steps where it is difficult to obtain a sample from a vessel without creating hazards or additional contamination. Samples can be quickly and easily taken using in-line samplers to monitor the quality of incoming chemicals or manufactured product. The valve is most commonly supplied with a spring return safety handle. 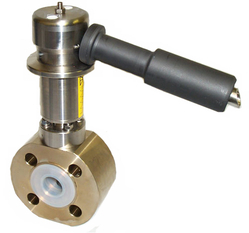 The standard valve has a 316L stainless steel body & spindle (PFA-lined for SD IL 400 model). The spindle is sealed from the atmosphere using a PTFE / Chemraz fluoropolymer stem seal arrangement. The spindle has a PTFE tip seal housed in a tight fitting radial groove. This spindle tip seal arrangement seals into a tapered seat machined into the body. When the valve is operated the spindle lifts off and away from its seat allowing process media to flow. The stroke limit of the spindle is adjustable and should be set when the unit is commissioned to give the correct flow rate. Alternative valve operator methods including twin action pull out handle, handle with locking pin, handwheel, and pneumatic actuator. Safety cabinet for containment of spills and fumes. Variety of dispensing assemblies using our modular connection.